A perfect summer evening down memory lane. I didn’t mean to send us down rabbit holes, twisting and turning down memory lane. I found an old nightgown while I was looking for some yoga pants and I thought Gracie might want the nightgown. She’s not really a nightgown person, but you never know. The nightgown in question had maybe been worn once, and I didn’t even remember buying it. It clearly had the fancy “VS” script on the front, and it’s possible I got it as a free gift while Christmas shopping, but who knows when that was. It’s been sitting on the bottom of my pajama drawer for years. Gracie took one look at what I was holding up, and then turned back to me. “Can I cut it?” she asked. “Of course!” I told her. I might have hesitated for half a beat, but I don’t think she noticed. It was a very quick yes. Maybe the nightgown could have been worth $45, but was anyone going to wear it? No. Would my mom have let us cut up an old piece of clothing? Absolutely. My mom might have her faults (who of us doesn’t? ), but she was awesome about letting us find out own fun and experiment with crafts any which way our hearts wanted. Gracie didn’t wait around. She quickly explained that she might tuck the sleeves and snip a little from here and a little from there, and she rushed off. A few minutes later, she bounded back into the room with the cutting board that I forgot we even owned. She used clothes pins to clip the material to the board and my fabric tape measure to make lines and notes in sharpie. That’s when Bee passed through the room and asked what was going on. Before long, she had spent her Michael’s gift certificate on Barbie patterns online and negotiated the scraps of material from Gracie. She pulled out the straight pins (“You know, Mom – from the apple? I mean, tomato? But not the real one!” Heh – the look on Jeff’s face!) and the safety pins (which ended up allllll over the floor because no craft session at Casa de Katie goes unpunished, but at least her sister offered to help without being asked), and then whipped up a creation with the material she had on hand. It was an impromptu sewing night, in the very best way. I love that my girls have my family’s crafting genes and think nothing of whipping up creations. I love that when they asked, I was smart enough to stop and think about how my mom or Auntie Cheryl would have answered. It was fun telling all the stories to Jeff. [Jeff: What’s that? Me: A cutting board. We used it to pin patterns, race matchbox cars, build forts…] And the results are cute! We still need to pull out my sewing machine and teach them how to use it (I think Bee already knows, but it’s been awhile), but the pinned pieces are fabulous! Not a bad way to spend an early summer night! What I wouldn’t give for patch of woods. 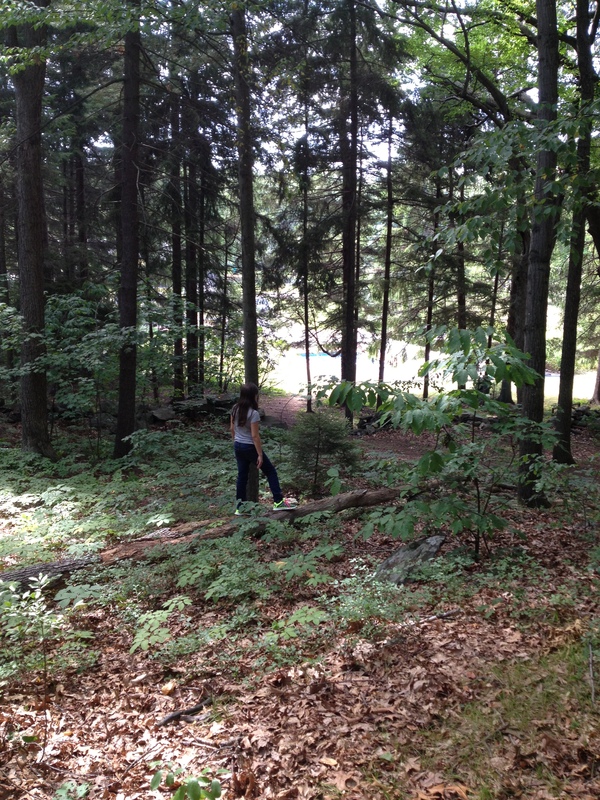 Towards the end of the afternoon, my sister suggested that the girls go for a walk in the woods. Somehow we talked my cousin Hillary into taking them, and then I went along for…well no reason other than I was nostalgic for “my” woods and the fact that they were my childrens. 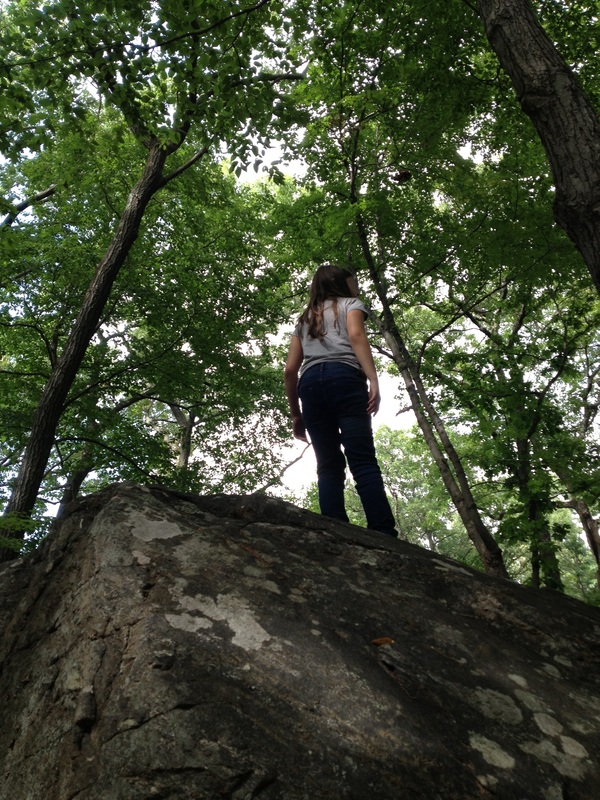 I’m pretty sure Gracie and Bee fell every bit as much in love with exploring in the woods and I did when I was their age. 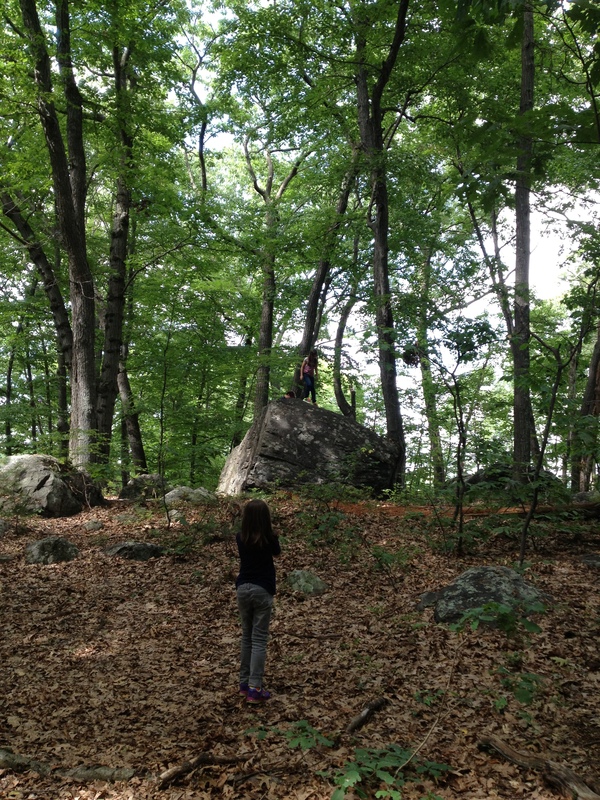 While I was busy marveling over how the patch of woods seemed to have shrunk (both in scope and in the size of the formerly very large rocks), the girls were stamping over hill and dale, searching out the very highest rocks to climb. Auntie Hillary helped them get the hang of the rock-climbing thing and laughed at all the silly things that came flying out of their mouths and the fearlessness with which they scampered. Auntie Kim joined us after awhile, and soon the three grown-ups were struggling to keep up with the littl’uns. The kiddos did make us come see a pool and berry bushes they had “discovered” – which turned out to be Aunt Patty’s house, which was just through the woods (and along a path) from Auntie Pam’s. They denied it up and down when I explained it was the pool where they had gone swimming before; they were so sure they had happened across a lost civilization in the middle of the woods. And then they were off again and Kim, Hillary, and I were walking aimlessly, talking about all of our different adventures in the woods from when we were little. We finally surfaced back at Uncle Mike’s, relieved to see the girls had found it before us (we honestly hadn’t heard them emerge), and about five minutes after we regrouped with everyone on the deck and grabbed a drink, Gracie and Bee asked if they could go back in. 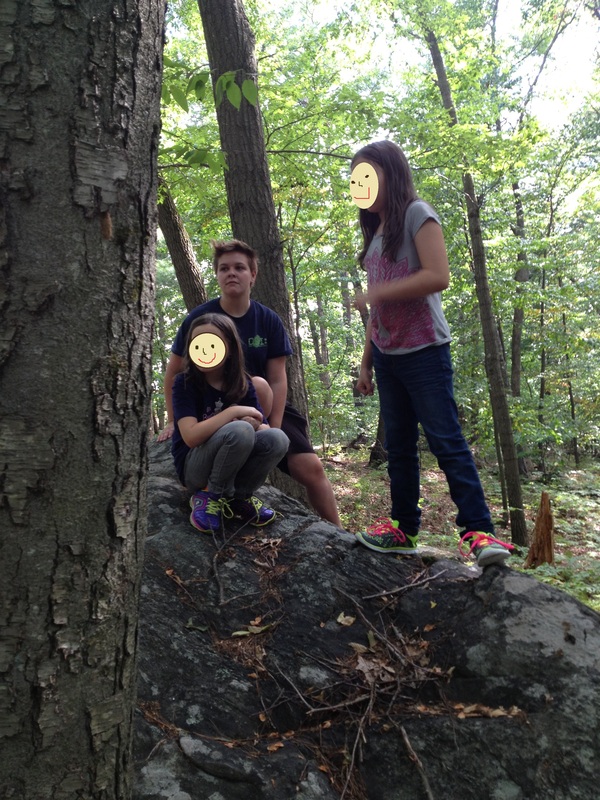 “We want to go climb on the rocks!” they chorused. What I wouldn’t give for a bit of woods with some climbing rocks, an absence of poisonous rattlesnacks, no fireants, and wasps smaller than feral cats here in Tejas. They still wouldn’t measure up to my woods back in New England, but I think the girls would love them just the same. Is it a throwback if it was just last week? Last Thursday, I was bouncing in my seat with impatience to pick up my besties from the airport. And lo, my vacation (and my friends!) finally arrived, and it was good. Better than good – it was incredible. I mean, what can top spending a long weekend with the ladies you’ve been friends with for 30 years? Exactly. 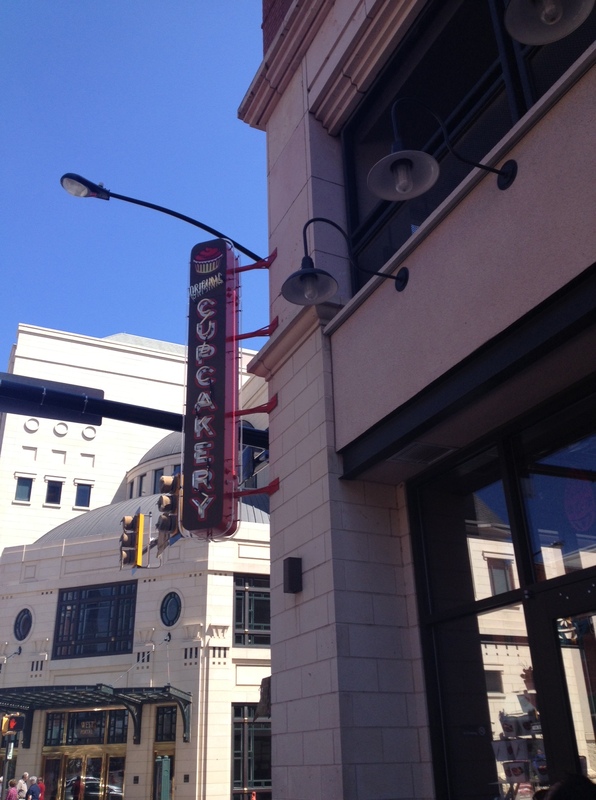 We walked all of downtown Fort Worth, shopping and soaking in some sun, and stopped for some famous Riscky’s Barbeque. Lunch in the sunshine on a patio downtown while gossiping with my favorite people? Yes, please! 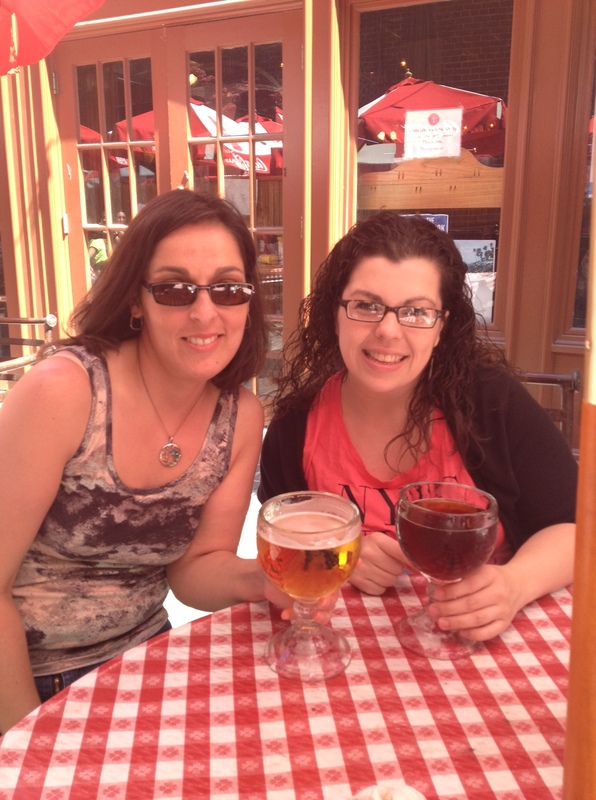 It did not hurt that the beers Corri and I ordered were possibly the size of a small fishbowl. 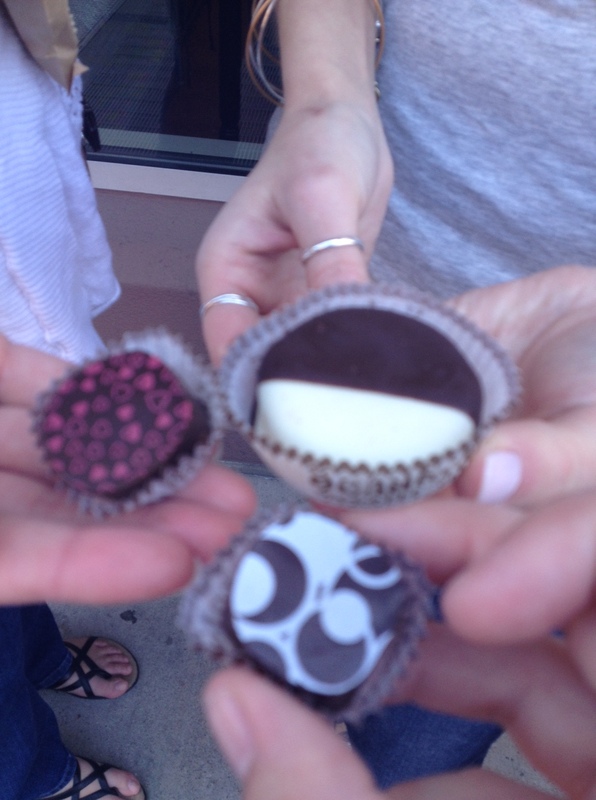 Those would be dark chocolate raspberry ganache, milk chocolate espresso cabernet, and chocolate covered oreo. Then, just a few feet down the street – for we were on vacation, as we kept reminding ourselves, we stopped at The Cupcakery to pick up some desserts for after dinner. Also, because the entire reason Julie came to Texas was to seek out alllll the cupcakes. Heh. After touring miles of downtown, we headed to a popular outdoor shopping area in Arlington, where we walked some more. Hey, you can’t say we didn’t burn off most of what we shoved into our faces. 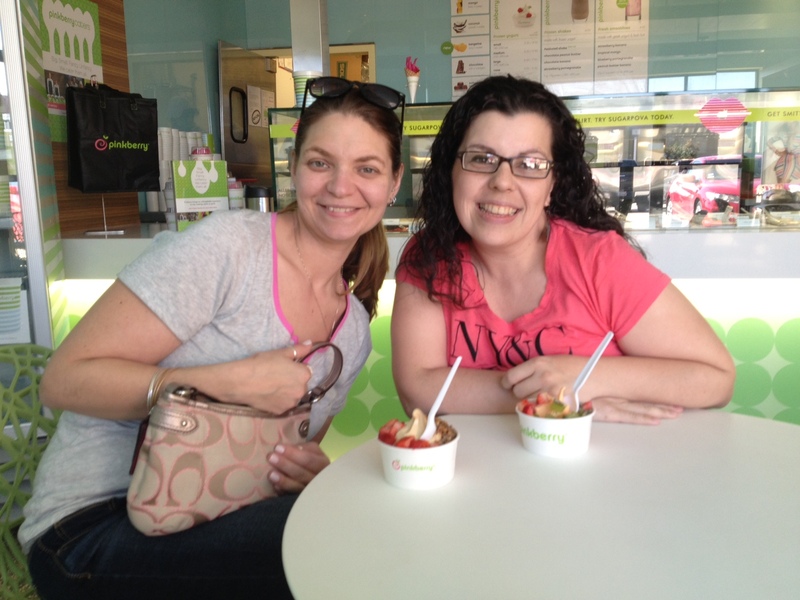 After a few more miles of shopping and walking, we stopped at Pinkberry’s. Tangerine frozen yogurt with strawberries and kiwis? Yes, please! That doesn’t include all of the drinking that happened when we collapsed onto our couches or lounged on the patio, basking in the sun (or when The Walking Dead finale drove Julie to drink!). It was fun playing tourist, and even more fun spending quality time with friends who know me almost better than I know myself. The people you can pig out with, cook with, fall asleep in front of, read with, abandon in favor a cat nap, share your sushi rolls with, and spend five days talking to non-stop – those are the people who are really and truly your friends, the people you need to keep in your lives. It was a fantastic weekend and I am already looking forward to the next one! The one with the really long story that is really about wishing someone a happy birthday. We started out in the little bedroom downstairs, me in my big girl bed and the crib against the wall, even though Kim slept most nights in the bassinet in my parents’ room. Just before baby Joey was born, we were moved into the big front room (which my parents sometimes used as their room), Kim in her crib still, and me in my brass-frame little girl’s bed. We didn’t last long in the front room – there was plenty room for toys, sure, but the noise from the main road was loud and frightened us (or so the family story goes), and so my mom moved the two of us – with Kim in a big-girl bed – into the back bedroom and my parents moved their bedroom into the front room. Kim and I shared that downstairs bedroom for years. She slept in the bed next to the window to protect me from all the scary things I imagined crawling into it, and I slept next to the open door to…okay, no, not to protect her from the same thing, it was so I didn’t have to sleep next to the window. Ahem. It was the bedroom where I first remember dancing around the room and on our beds, listening to the radio and our first cassette tapes. It’s where we had chicken pox, confined to our beds for an entire week, and where we learned to stay quiet while we were supposed to be falling asleep so that we could hear what our parents were saying in the next room. Yeah – that there? That bit about our first baby steps as spies? Kim always fell asleep. When our bedroom moved upstairs, our dynamic duo was broken up for a short time. I moved upstairs first on my own, and then when I wasn’t eaten by monsters during the night, my parents moved Kim into the other room upstairs. Although now that I think about it, I think perhaps they moved Kim upstairs in an attempt to calm me down. I shouldn’t be scared because Kim was right next door! After a year of that particular experiment, they went ahead and bunked Kim and I in the same bedroom upstairs. The little room we used as a playroom, and then as Joey’s room when Rhianyn was born. That upstairs room is when Kim and I really first became the “stilly stisters” that Bee and Gracie know us as today. We fought like cats and dogs at time as we learned to negotiate boundaries – and when to both abide by them and ignore them. And as our relationship grew and changed, the layout of our bedroom did, too. We jumped from bed to bed (and broke Kim’s bed at least once), we stayed up late telling stories, I learned to fall asleep to Kim’s breathing when I woke up from a nightmare and she learned to fall asleep to my reading light when I stayed up late. 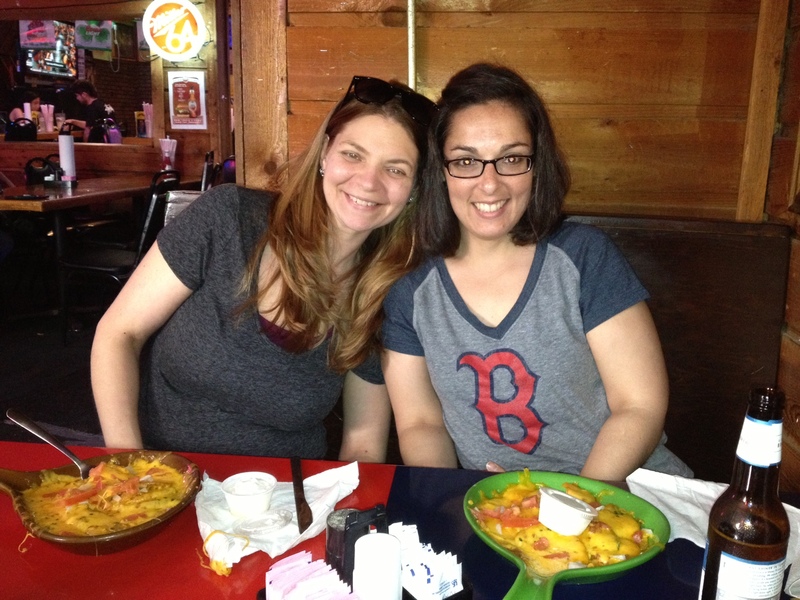 We counseled each other through boy problems and friend problems and parent problems and played endless board games. Our bedroom was our shared home-base, our headquarters where we could escape from the rest of the world and regroup. When I started my second year of high school, my mom decided it was time to let me have my own room. I deserved some privacy, she said. I moved into the little room upstairs, Joey moved down to Rhianyn’s room, and Rhi moved into my former space in the big room upstairs with Kim. And that was how Kim and I learned that we were weren’t hanging out with each other because we had to – we liked hanging out with each other. She spent countless hours in my room doing the same things we had done when it was our room. Our separate space gave us corners to retreat to when we needed it – and boy, did we need them some days! – and a new understanding of just how close we we had become. College was different – not only did we have separate bedrooms, we were living under separate roofs for the first time. But summers reunited the dynamic duo, as we were once more back in the big room upstairs together. That took some…readjusting. No sooner did we negotiate a new treaty on how to share our space and save our collective sanity than I did a very ridiculous thing – I moved to Texas. And then Kim was ridiculous in refusing to move with me. But even after all of these years, all of these separate bedrooms and safe spaces and hideyholes where we go to retreat from the rest of the world, my sister and I still have that connection, that sense of comrades-in-arms that can only come from gutting it out in the trenches – or sharing your childhood bedroom. Happy Birthday, Kim. Thanks for not killing me in my sleep any of those millions of times you wanted to. Everyone knew Uncle Teddy loved dogs. 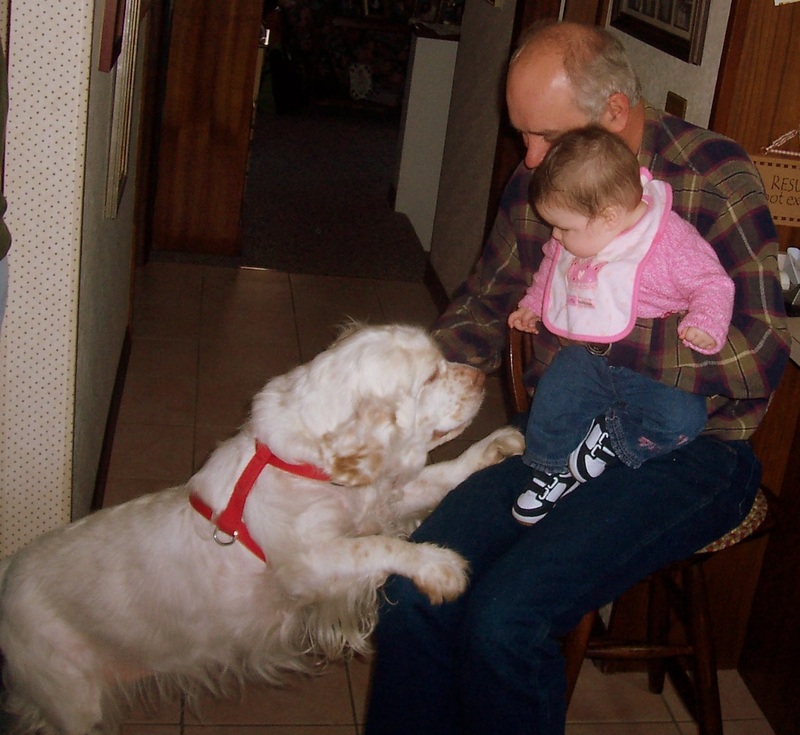 There were always one or two (or sometimes more) running around the house where he grew up, and dozens more in his neighborhood, and he always had a dog at he and Auntie Cheryl’s house. First was Thumper (I don’t even know if my cousins remember her; she was killed by a delivery truck when I was still little, only I didn’t know that at the time – I only knew she had died). Then came Jade, who Kene and Shayne grew up with. And then came Doughty, named after Uncle Teddy’s mentor and dear friend who had recently passed. Fewer people knew that Uncle Teddy loved kids. He had a lot of bluster, he could be very prickly, but he couldn’t quite hide the twinkle in his eye when he was giving you a hard time. I’ve said it a hundred times – teasing in our family meant that we liked you enough to harass you. If we weren’t teasing you, either we didn’t care or we were upset. But I’m getting off track – I was talking about Uncle Teddy and us cousins. He would always make time to talk to us, to show us things and explain them to us, and he never talked down to us. He expected us to hold our own. It was a small thing, those three off by themselves, with really nothing extraordinary about it. It was just an everyday moment: Doughty being curious, yet so well-trained. Gracie being okay with everyone and everything new around her. And Uncle Teddy being Uncle Teddy. The simple joys of summer. There is a certain water spigot at my mom’s house that has gotten quite a lot of us kids into trouble over the years. It’s the outside faucet, one that we kiddos quickly learned how to turn off and on. We’d use it to make mud pies, to make moats in the sand box, to fill the pails when we were playing soup chef, to give the dog more water, and, on more than one occasion, to splash each other. All of this abuse is certainly why, after shouting through the window to Stop turning the water on!, my mom eventually took water privileges away from us. One day we went out and the handle to the water faucet was gone. I’m sure there was a lecture that probably went along with the mysterious disappearance, but I’ve blocked it if there was. But, because my mom loves us and because she was a softie (and quite possibly because we were rather lovingly relentless), we discovered before long that the handle to the water faucet was kept in my dad’s top dresser drawer. Now, my dad was kind a scary person when we were little. He was a strict disciplinarian and not very big on parental bonding. You can imagine how daunting it was to go fetch the faucet handle out of his drawer even with our mom’s permission, never mind when we were sneaking it out. Of course, the very idea of sneaking is kind of laughable now. Sure we were quiet and sneaky enough to get the handle out undetected. We could even put it back exactly as it was. But the thing about the outside water faucet is that the sound of the water coursing through the pipes was loud. It could be heard throughout the entire house. Not so sneaky. But definitely fun! 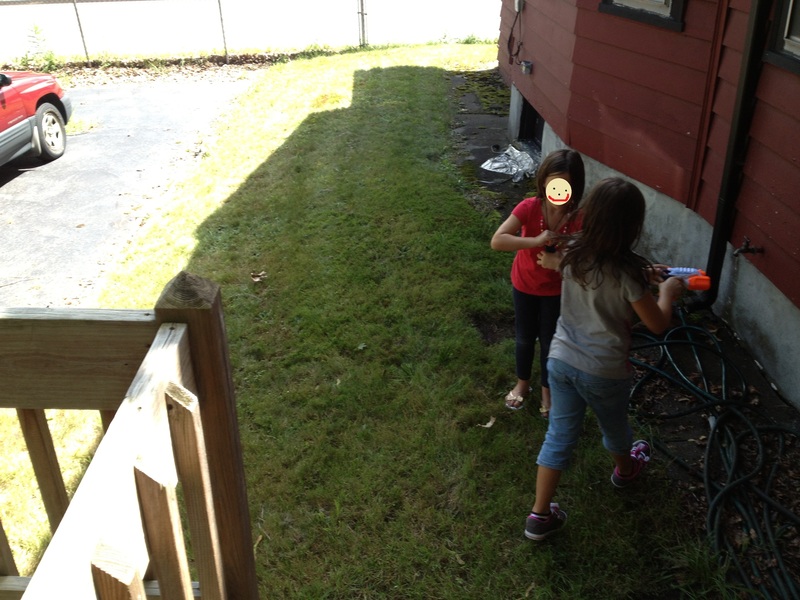 When I was trying to think of ways to keep the girls entertained while we spent time visiting my parents, the idea of water guns came to mind. I thought it would be a fun way for them to interact with their (immobile) grandfather. He could sit on the deck, armed with a water gun, and they could run around down in the yard and try to evade his fire and get him back. Add in Uncle Joey as a not-so-secret weapon for either side and you have a lot of fun. Grandpa didn’t play, but the girls and Uncle Joey sure did. Auntie Kim and I bought Joey a huge super-soaker and the girls these tiny little guns. The disparity cracked us up. The girls didn’t think it was so funny at first, but I did hear a suspicious amount of laughter and shrieking as they ran back and forth to the water faucet to reload. The three amigos had been at it for more than an hour before I remembered that I didn’t think to bring extra clothes for my soaked urchins to change into. Whoops. Oh well – I was planning on buying them new Red Sox t-shirts anyway. I maybe had to negotiate a cease-fire as I made my way to the car to go get dry clothes, and when I came back, the girls were running around nearly nekkid, but that’s what summer’s for, I guess. Water gun fights, playing with crazy uncles, and filling the house with the sounds of shrieking laughter and that damned loud water faucet running full tilt. Simple fun, but the kind that makes you sleep like the dead at night. How can you beat that? It was unseasonably warm here this weekend. No one had the flu. Everyone was healthy. Cranky, maybe, but healthy enough for me to send the whiners outside to play, so that was okay. Not that there was any complaining about the outside time. About everything else in their lives, yes. Complaining. And maybe about the fact that we didn’t have time to drive to the park. But there was no complaining about getting to ride scooters outside. They were happy enough to share the 3D chalk set that one of them got from Santa. They made soup from dead grass and obediently stayed away from the rain water that had gathered in pots…after getting yelled at for it, but who can blame them? It was gorgeous outside. Their souls rejoiced in the warm weather clothing options, too. Being able to wear skirts and short-sleeved shirts that the girls beg for all winter long. (Woe is the child who isn’t allowed to wear skirts when it’s 40° outside. I’m a mean mama.) I was even temporarily queened Best Mom Ever! when I could finally tell my Bee-child that Yes, she could wear her sandals after weeks of requests during much chillier weather. Being able to eat lunch outside on the patio was a treat. I think we were all as starved for outside time as we were for food; no one complained when the wind gusted and we had to hold on to our paper plates. By the end of the day, I was just happy. Grinning with actual contentment. I didn’t mind the humidity inside the house, or the fact that the temps inside climbed as high as 74°. There’s something about that first warm air inside the house after a cloistered winter that makes everything seem more cozy. I spent a good portion of the late afternoon lounging on my bed, reading and listening to the kids catching ladybugs outside and listing every bug they found crawling around. Something about the outdoors sounds and indoor reading on my bed next to my window made me feel like I had been whisked away to my mom’s house, where I spent many, many weekend afternoons reading in my bed by the window, listening to my brother and his friends playing outside. It didn’t hurt that I was re-reading an old favorite, a novel I read several times in those days. The nostalgia was so strong that it was a little jarring later that night when I padded around the house barefoot, checking the locks and shutting down the house for the night, remembering I was the grown-up in charge of such things. It was just one day – and not one without bumps – but the breath of fresh spring air was just what Casa de Katie needed. One of my favorite advent(ure)s.
Last night, I hurried the girls through their dinner, but wouldn’t tell them why. “Hurry up! Let’s go! We might need extra time for our Advent activity!” was all I would say. We were going on a Christmas light tour. It’s not nearly as organized or as formal as it sounds. We steer far away from the tangled traffic jam near the famous “official” Christmas light tours that are near us. Instead, we bundled up in our pajamas, picked out our desserts, and hopped into the car for our own organic, “Hey! Let’s look down this street!” kind of tour. Gracie was disappointed – at first – that we weren’t walking. When the girls were much, much younger and it was difficult to get everyone strapped into their 82-point harnesses and car seats and Bee-Baby didn’t have any much of an attention span, I would bundle the girls up and pile them into the wagon and do a walking tour of the neighborhood. There’s something lovely and forbidden to a little kid about being outside in pajamas and a winter coat in the middle of the night…even if “middle” means something between half-past sunset and quarter-til-bedtime. But I wanted to expand a little farther than just the neighborhood, and by golly, I wanted to listen to Christmas music while we were touring. So we looped around our own neighborhood and then went driving through a rather ritzy neighborhood that’s tucked out of sight between our house and daycare. We oohed and ahhed, counted snowmen, Santa Claus inflatables, and one GIANT polar bear. We even had a lovely discussion of poor vs. rich, and then rich vs. happy, with my childrens happily declaring they like being poor. Win? It all made me wonder how made up our little tradition is. Are Christmas light tours – running around other people’s neighborhoods, the ones not designed for a show – is that a thing? I know there are official designated Christmas light shows in certain exclusive major city neighborhoods, but…this off-the-beaten-path thing – is it just us? It’s something I grew up with. We had only one car for most of my childhood. My mom would drive my dad to work every morning, waking me up to watch the younger children at home while she made the 20-minute round trip. (Can you imagine doing that today?!) In the evenings, she would wait for him to call from the bar (God, that sounds so much more gauche than saying the Tap Room), and then she’d pile the three of us kids (this was before Rhi) into the station wagon and off we’d go. Driving to the Tap Room was a longer trip, and to keep us entertained, Mom would have us count Christmas lights and sing Christmas carols at the top of our lungs. Okay, the top of our lungs part might have been ad libbed; I’m pretty sure that wasn’t a directive. But Mom loved the holidays and she loved us kids, so she rarely said anything about that bit. It’s an awesome Christmas memory to have. And so year after year, no matter how many new Advent(ure)s I add to our own calendar, Christmas light tours return. Maybe I can’t cajole my kids into caroling with quite as much gusto as we had, but maybe our kind of crazy skips a generation. But I rather hope not. Every day I’m faced with reminders that my babies aren’t even close to being little any more. In fact, they are closer to being tweens than they are toddlers. From the eye-rolling to the whining to the hair-fixing to the dreadful taste in Disney radio tweenaged music, the evidence hits me all the time. I recently had to dig through pictures from when the girls were 18-months and 3 years old, with their pudgy little legs and their dimpled hands and ohmygod the cheeks! I nearly cried. My kids are definitely big kids now; I can barely see the chubby little toddlers hiding in their big-kid bodies. But last night… oh my heart, last night. Bee had a headache and had gone straight to bed without whining or fussing. She didn’t even want the light on. When I put Gracie to bed thirty minutes later, Bee started whining because Gracie wanted to listen to a CD. I made sure the music was low, soothed Bee and rubbed her back, and thought she fell back to sleep. Ten minutes later, just as I shut off the television and was thinking about climbing into bed with my re-read of The Help, I heard the girls’ door open. Poor sleepy-eyed Bee was trying to hold back her tears, her little chin wobbling. “I still have a bad, bad, bad headache,” she said. Bee and I have this thing – no matter how hot-tempered I am, even if I’ve just yelled at her for the 30th time to get back in bed, if she comes out to the living room and asks to snuggle, I do it. Happily. Don’t ask me why I’m able to keep my temper in check then, but not other times. Maybe it’s because I remember snuggling against my mom’s fuzzy yellow robe when I was very, very young. Maybe it’s an overwhelming desire for my kid not to have more bad memories than good. Who knows? But it’s our thing. And last night, she activated the superpower. So Bee climbed into my lap, I tucked her head against my shoulder, and started rocking her just the littlest bit. Her big-kid legs (and even bigger feet) were dangling way past my lap and over the couch cushion, but the rest of her was tucked up against me, almost like it used to be. I expected to cuddle for a few minutes, wait til she was sleepy-ish, and then bring her back to bed like I do when we cuddle. But then my Bee-baby fell asleep. In my arms. I heard her breathing even out and I sat there for the longest time, still rocking, trying to remember how many years it’s been since once of my babies had fallen asleep in my arms. Three? Four? My girls fight bedtime with ever fiber of their being – they always have – and if they’re up, they’re on the go. I haven’t felt the miracle of lulling a girly to sleep in so, so long. Anyone here saying that isn’t a miracle is not a parent. After ten or fifteen minutes, when Bee was completely zonked and I was on my way, I stood up and carried her to bed. I tucked her in without injuring either of us (praise Jeebus) and then crawled into my own bed to read my book. It was just a few moments in the middle of a hectic week, but they were perhaps the most calming I’ve felt in ages. Sometimes all it takes is a song. I was having a craptastic night. I had spent most of it drowning in a pity party, crying because I was sick of feeling sick, because I felt blown off and unheard by the stupid substitute doctor, and because I still didn’t have any answers about my constant nausea and occasional severe stomach pains. Was it gallbladder issues or an ulcer? Who the hell knows? And, hey, you’re crazy for trying to get answers! And who cares if I could eat anything but fruit and chicken broth! And while you’re at it, don’t take anything but Tylenol for your back, even if Naproxen is barely getting the job done! HA! I felt physically moved. Really: a whooshing sensation flew over me. I stopped wiping down the counter and stared at my daughter. Then I sang along, “I don’t care if the rain comes down, I wanna dance all day…” and led her into the chorus that ghosted out of my memory right behind it, “Rain, rain, carry me away, I wanna dance all day…” Gracie smiled, surprised, and sang with me. “You know that song?” she asked, delighted. It was on a record, I told her, not waiting for her to ask what a damn record was. One that we listened to all the time when we were kids. It was called “Rainy Day Record” and we borrowed it from the public library we frequently visited. They didn’t have it at our main branch, only at the small town library in the neighborhood where my mom grew up. I think we borrowed that record a hundred-eleventy times a year. We’d bring it back, get something else, and then borrow it right back again the next time we visited. I remember there was a cloud song. And some spoken word poetry. Maybe a mirror song? And…well, I can’t remember the others, but we danced to all of them. In the small bedroom downstairs, in the kitchen, around, over and on top of my parents bed on Saturdays when my dad was at work… It was a constant soundtrack to my early childhood. And then at some point, I don’t know when, it disappeared. I can’t remember when it was phased out of our childhood rotation, or why. Did we move on to other loves, other music, other diversions? Was it broken and never replaced by the library? Did we outgrow <gasp> our Rainy Day dances? Whatever happened, I remember trying to track down the record in high school for grins and giggles. I had a stereo that let me transfer records onto audio tapes (just as we were phasing in CDs, too), and I bet I was trying to capture our childhood favorite for posterity. But I couldn’t find it. I checked again when Gracie was big enough for rainy day dances of her own and came up empty. Searching the library’s database didn’t even help. Google failed me. If my memory wasn’t ironclad, I’d worry that I’d made the entire record up. Last night’s moment of kismet sent me searching once again. After two hours and myfingersfelloff+eleventy Google searches later…I found it. I found the blue blurry cover I couldn’t quite remember. (Point of note: it was actually a black-and-white but really grayish pic of two girls laughing under and umbrella with big sky blue bubble letters in the title giving an all-over blueish tint.) I found the song list. I found the list of the story segments. (It was an entire story?! Hunh.) Rainy Day Dances, Rainy Day Songs. Narration by Anne Lief Barlin, sung by Marcia Berman and Patty Zeitlan. I found all of it. Validation. I ordered the CD. Maybe it will be a Christmas present for Bee-girl. Maybe it will be just something I tuck away for myself to help me remember. But I think the real moral of the story here is that with a lot of perseverance and the right attitude, even rainy days (and craptastic nights) can end okay. Especially if you dance your cares away.